So basically with each year of proper training, your potential to build muscle is halved. 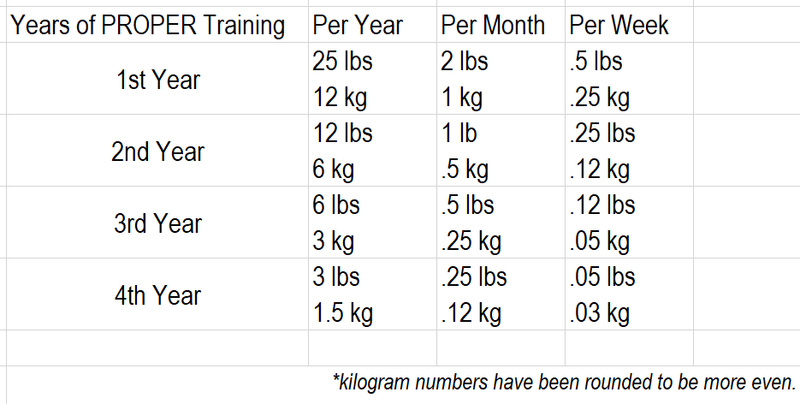 Starting with approximately 25 lbs or 12 kg total in the first year and calculated from there. Admittedly though, this doesn't technically answer your question. This is simply the expected upper limit as opposed to an absolute. I'm unaware of any studies that explore an absolute limit, I'm not even sure how such a thing would even be conducted. Regardless, this is accurate to most people. Keep in mind however that this is the expected upper limit, not necessarily how much will be built on average. I can't provide any kind of concrete answer, but I can imagine there's probably a rather hard limit imposed by your testosterone levels. It's my understanding this is the largest differentiator between men and women specific to muscle development, and it's the primary thing being modified when people take steroids. Those are both strong indicators that increased testosterone levels can, without requiring any other proportional changes, cause an enormous increase in your capacity for gaining and retaining muscle. I specify proportional changes to account for increases in caloric intake, weight sizes, etc. that clearly need to scale up as muscle size increases, but are still being scaled up instead of being materially altered in some way. Honestly we don't even understand our own nutritional needs as well as we'd like to think. This becomes very clear when you start to look at bizarre, entirely-unrecommended-for-most-everyone diets like the all meat diet. If you listen to what most people tell you something like that should cause crazy problems and maybe even kill you...but that doesn't seem to be the case. Your digestive system hates you for the first few weeks though. Until we understand our bodies far better than we currently do I'm not sure a specific limit for a given person can be rigorously determined. Not the answer you're looking for? Browse other questions tagged muscle muscle-gain or ask your own question. Reducing flab and Building the Upper Body simultaneously - Guidance?